While infrastructure work and demolition of the massive plant itself have been undertaken since the closure of the General Motors minivan assembly plant here in 2006, the first dirt has been turned on phase one of the long-anticipated $1-billion redevelopment of the property now called Edge on Hudson. Toll Brothers has started construction on its “Brownstones” collection of luxury townhomes at the property. Toll Brothers is planning to build as many as 306 units of for-sale condominiums and rental apartments. While work has commenced on the first residential units at the property, the master developers of the project, a joint venture of California-based SunCal and New Jersey-based Diversified Realty Advisors, have already begun infrastructure work on phase two of the Edge on Hudson development. The SunCal-Diversified Realty Advisors partnership purchased the 96-acre property from General Motors in January 2015 for $39.5 million. The project, originally named Lighthouse Landing, is being built on approximately 96 acres that at full build-out will encompass 1,177 units of housing, a 140-room boutique hotel, 135,000 square feet of retail space and 30,000 square feet of office space. The project will also feature more than 16 acres of parkland, and a winding promenade along the water linking to the existing Scenic Hudson RiverWalk to the south and Kingsland Point Park to the north, with links to Rockefeller State Park and beyond. Toll Brothers, which acquired its development site from an entity of the SunCal-Diversified venture earlier this year, is constructing luxury loft condominiums, townhomes and multifamily apartment units at the site. The Lofts Collection will feature 46 condo flats with one-, two-, and three-bedroom residences ranging from 800 square feet to 1,800 square feet. 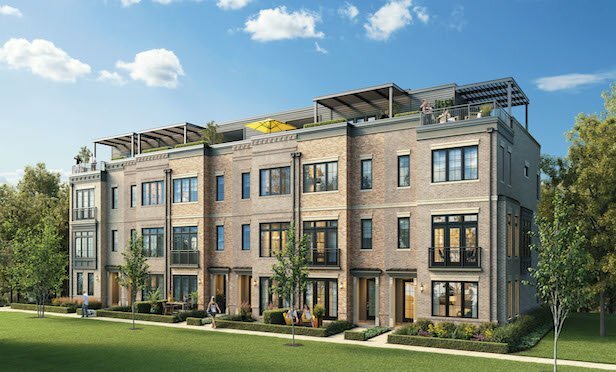 The Brownstones Collection will feature three- and four-story townhomes with large rooftop terraces, and 72 townhomes with up to 3,000 square feet available. The firm is also planning 188 multifamily apartments in three, four-story buildings and the anticipated unit size range will be from 700 square feet to 1,200 square feet. The sale price of the more than 10-acre parcel between Toll Brothers and the Sun-Cal Diversified venture was not disclosed. James Fitzpatrick, division president, New York City area for Toll Brothers, says the sales gallery for the Edge on Hudson residential project is scheduled to open in November. He says that Toll has been in talks with SunCal-Diversified for some time on acquiring a portion of the site for residential development. The site is located on the banks of the Hudson River and nearby the new $3.9-billion Mario M. Cuomo Bridge. He adds that the Edge on Hudson will be a walkable transit-oriented riverfront community, located approximately 35 minutes from Manhattan by express train. “It is an extremely unique opportunity,” he adds. “These opportunities certainly don’t present themselves very often in this part of the world. The Brownstones unit will sell at prices beginning at $1.2 million and are expected to be open for occupancy in the fall of 2019. Construction on the Lofts Collection will begin this winter. A groundbreaking for the multifamily units has yet to be determined. The Lofts condos will include one-, two- and three-bedroom units, ranging from 800 square feet to more than 1,800 square feet. Pricing will start from the $600,000s. Rental apartment options include one-, two- and three-bedroom units. Monthly rents haven’t been finalized. Out of 188 rentals, 40 units are set aside for senior affordable housing and 21 for workforce housing.